Virginia has become a magnet for road cyclers. Why you ask? Consider first that Virginia offers two of the finest road cycling venues in the country – Shenandoah National Park’s 105 mile Skyline Drive and the 216 miles of the incomparable Blue Ridge Parkway. Then add two-lane road rambling through the rustic countryside of the James River Valley and the lesser visited lands of the salty Eastern Shore. Looking for the road less traveled? Roll your way through the Allegheny Highlands into deep Southwest Virginia. The number and variety of road cycling trips in Virginia spells opportunity for you to get away from the routine, onto your two-wheeler and begin your fall Virginia road cycling adventure. 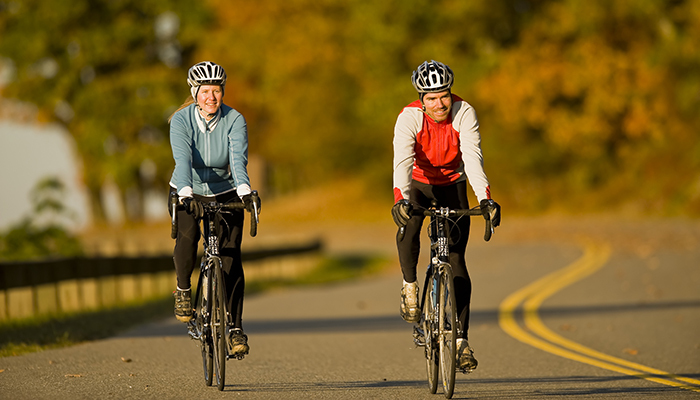 Whether you undertake a fall road cycling trip for a day, a weekend or a full week, the following will give you places to see the beauty of autumn that only Virginia can deliver. Check out these 5 suggested road cycling routes then decide where you want to make your Virginia fall road cycling trip. The Route: This 80 or so mile road cycle route explores Virginia’s Eastern Shore, starting near where the Chesapeake Bay Tunnel emerges on the Eastern Shore, then ends in the excellent destination of Chincoteague near the Maryland state line. The south to north route up the serene and scenic Eastern Shore is a lesser-known, underutilized road cycling route and will offer autumn color deeper into the season than mainland Virginia. 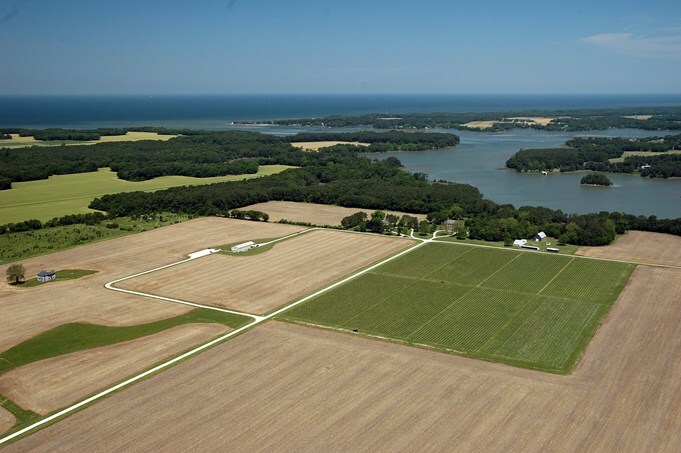 From the southern tip of the Eastern Shore near Kiptopeke State Park, road cyclers join VA 600, Seaside Road, as it winds through fields, farms, and quiet communities tied to ocean life, bridging tidal streams. Most of the Eastern Shore’s “traffic” heads up and down US 13, leaving VA 600 as the route for road cyclists. You’ll pick up VA 679 near Metompkin. Up near Wallops Island follow the signs to cross the finish line in Chincoteague. Despite the rustic nature of the landscape the Eastern Shore has more than ample food, lodging and entertainment possibilities, though you may have to detour a few miles off VA 600 to access them. The country roads are flat and ease the strain of a pedaling tour, allowing you to focus on having a good time instead of just getting there. The Highlights: This tour is mostly about enjoying the continuous eye-pleasing scenery that is the Eastern Shore. Wildlife is abundant, especially birds. 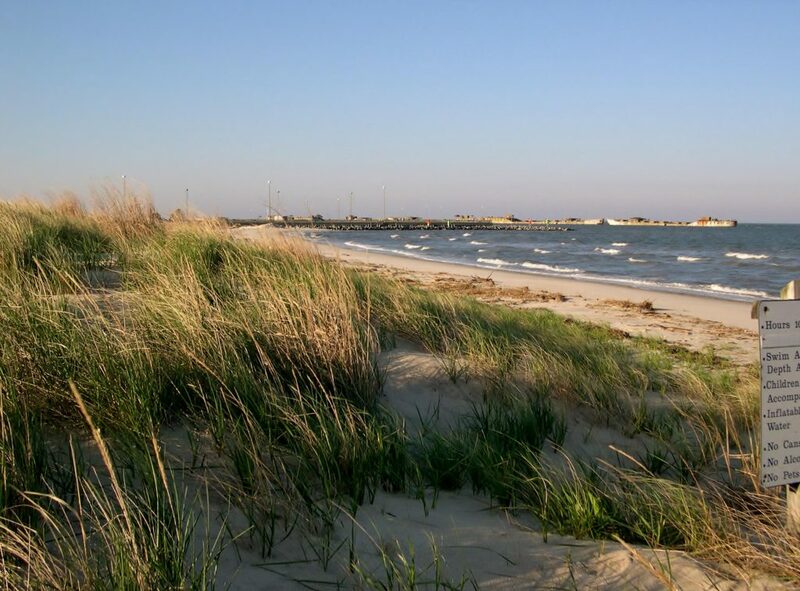 You will certainly be tempted to stop over at two famous national wildlife refuges dotting this tidal land — Eastern Shore of Virginia National Wildlife Refuge and Chincoteague National Wildlife Refuge, as well as protected state lands. You will be cycling through a mix of field and forest, very much on the level side. The excitement builds while bridging larger bodies of water near Chincoteague, an exciting island with loads of beauty and lots of fun activities. Nearby Activities: Camp at Kiptopeke State Park. Eat at the Oyster Farm at Kings Creek in Cape Charles. Enjoy a tasting at Chatham Vineyards and Winery. Explore Brownsville Preserve, a Nature Conservancy property near Nassawadox. Overnight at the 1882 Colonial Manor Inn in Onancock. In Chincoteague, paddle about on a kayaking nature tour. Join a fishing charter. Overnight at the Channel Bass Inn Bed and Breakfast & Tea Room. Check out the Museum of Chincoteague Island. See the lighthouse and wild ponies at Assateague National Seashore. 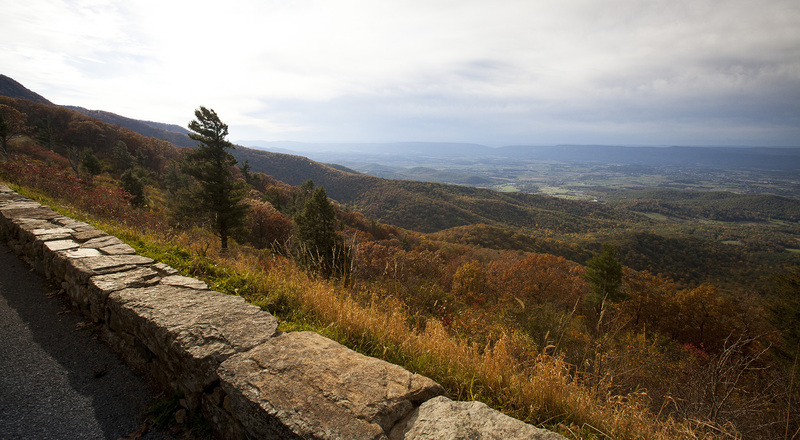 The Route: Skyline Drive was the world’s first touring road, making this 105-mile two lane ribbon winding through the heart of Shenandoah National Park a clear choice for fall road cycling. And not only can you relish pedaling Skyline Drive and the national park amenities from lodges, campgrounds and waysides, the adjacent towns outside the park are full of services to sate your needs as well as dining possibilities and other activities. 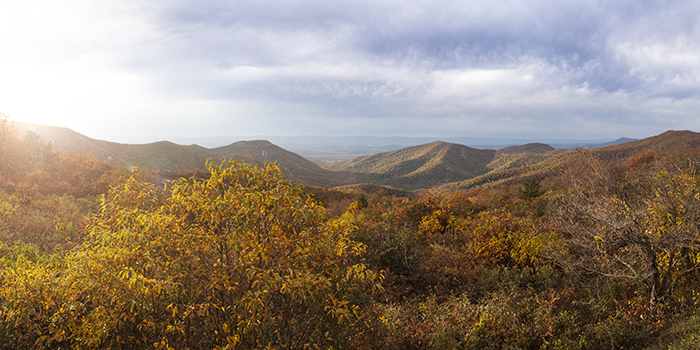 Autumn color can be simply breathtaking in Virginia’s grandest national park. The two lane paved road offers eye popping montane scenery along the way – and 75 overlooks luring you to stop and snap a photo of fall color near and far. The hills can be challenging. The low auto speed limit and expectations of seeing bicyclists allows you to focus on the sights along the ride. The Highlights: Want to jump off the bike and see Shenandoah up close on foot or learn a little more about the park? Over 500 miles of hiking trails take you to overlooks, waterfalls and cultural sites. Or simply step off the bike and make a short stroll down a nature trail. Stop at one of two lodges along Skyline Drive to spend the night or take in a meal. Bringing your tent? Pitch it at one of several campgrounds in the park. Nearby Activities: The towns nestled in the shadow of Shenandoah are there to service cyclists with lodging, dining and entertainment. In Front Royal you can head to the Virginia Beer Museum or grab a meal at the Front Royal Diner. The Apple House is a well known homespun eatery. Luray presents an array of eateries such as the Gathering Grounds Patisserie & Café or The Speakeasy Bar & Restaurant. While here check out the Luray Valley Museum or relax and listen to the bells at Carillion Park. Lodging includes several B&Bs in historic houses, such as the Woodruff House Bed & Breakfast. Fish the Rapidan River near Madison. In Elkton eat at the Log Cabin Barbeque, visit the White Oak Lavender Farm & The Purple WOLF Vineyard. Overnight at the Hensley Hollow Lodge, close by Skyline Drive, or the Montfair Resort Farm near Lydia. Carter Mountain Orchards near Charlottesville makes for a fine fall destination. Why Ride Here: Combine road routes with the paved Capital Trail, creating a cycling trip from the Appalachians in the west to the tidelands of the Atlantic Ocean in the east, exploring the entirety of the expansive James River Valley, through the heart of Virginia. The Route: Depending on roads chosen, you can make this fall color road cycle extend up to 280 miles. The most adventurous road cyclers will start their journey at Lake Moomaw, in the James River headwaters. The first part of the route traces the Jackson River, a tributary of the James where colorful mountains rise above. Buchanan is directly on the James River, a crossroads and epicenter of non-cycling activity. The route continues to break east through the Appalachians. Prepare to earn the breathtaking scenery until coming to Lynchburg, where you enter rolling Piedmont terrain. The cycling becomes less strenuous once out of the mountains, yet the scenery remains rewarding. Join the Virginia Capital Trail in Richmond, traversing historic sites, culminating in at Jamestown Settlement. From there join the scenic Colonial Parkway to end in Yorktown. What an adventure! The Highlights: Mountain-rimmed Lake Moomaw makes for a bang-up start. This highland reservoir is a feast for the eyes. Falling Spring Falls wowed even Thomas Jefferson. Waves of mountains combined with rugged valley scenes characterize the uppermost ride. Make your way through the towns of Covington and Clifton Forge. It’s a challenging yet gorgeous bike trip bisecting the Blue Ridge. Find yourself in Lynchburg, home to Liberty University. Beyond there, long stretches of rural Piedmont Virginia move by. Then you reach Virginia’s capital city of Richmond, with excitements galore such as the Riverwalk and dining to meet every taste. 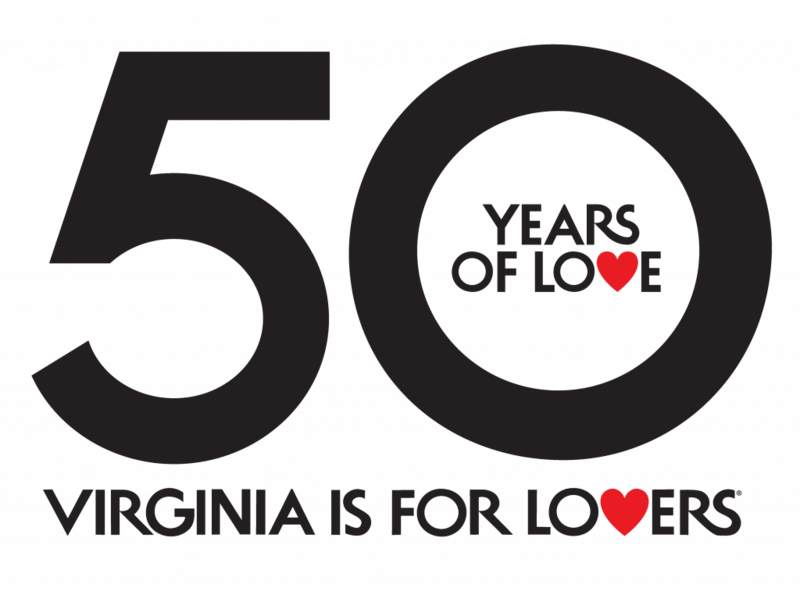 The next 50 miles are on the Virginia Capital Trail, with paved, car free pedaling through the lower James River Valley to make historic Jamestown. Beyond there join the 23 mile Colonial Parkway. This scenic and safe national park operated road leads you through Colonial Williamsburg to Yorktown, a place of Revolutionary War history. Nearby Activities: The varied segments of the James River present canoeing and kayaking opportunities the entire route, from raucous whitewater to mellow flatwater. Outfitters are stretched all along this majestic waterway. 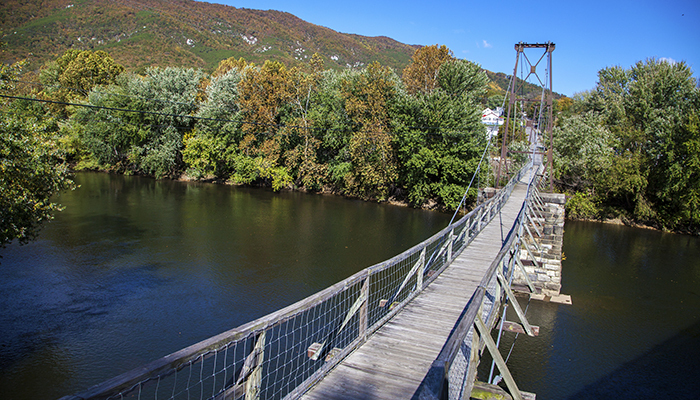 Walk the swinging bridge in Buchanan. Visit Natural Bridge near Glasgow. See Thomas Jefferson’s Poplar Forest near Lynchburg. Bicycle the James River Heritage Trail through Lynchburg. Visit Thistle Gate Winery near Scottsville and stay at Chester B&B. Camp at Powhatan State Park. Grab a cold one at Lickinghole Creek Craft Brewery. In Richmond, visit the home of Justice John Marshall. Eat at L’opossum – an eclectic and funky spot for French cuisine. make Yorktown and enjoy Riverwalk Landing and the Watermen’s Museum. Celebrate your completed tour at the Yorktown Pub. The Route: Road cyclists dream of pedaling Virginia’s Blue Ridge Parkway during the autumn leaf season. And why not, with 216 miles of winding two lane road coursing through the Appalachians it is made for touring. The Parkway begins on the south end of Shenandoah National Park then traces the Blue Ridge to North Carolina. Fall colors will be vibrant as you course through forested highlands and gaze down on the Piedmont and valleys below. The Parkway is hilly, so road cyclists need to be prepared for challenging uphills and speedy downhills. Numerous overlooks and interpretive information make for rewarding rest stops along the way. Roadside lodging is limited to campgrounds and Peaks of Otter Lodge. However, adjacent towns, including Roanoke, provide a variety of dining and lodging opportunities, and opportunities for off-the-bike fun. The Highlights: The Blue Ridge Parkway is known for its short interpretive foot trails, perfect for cyclers who want to pull over. For example, visit the Carter Farm with its historic structures. Stroll to Wigwam Falls. Circle Otter Lake. Walk the .4-mile Trail of Trees interpretive path. Visit historic Johnson Farm. Take the tram up to Sharp Top. And on it goes. Grab a view at Smart View. 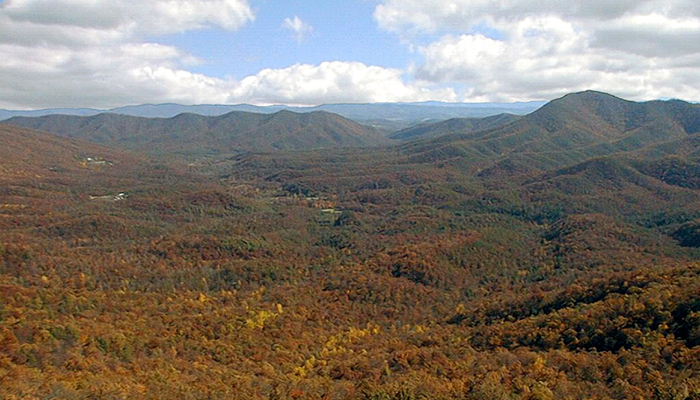 Explore the visitor center and have a picnic at Rocky Knob. 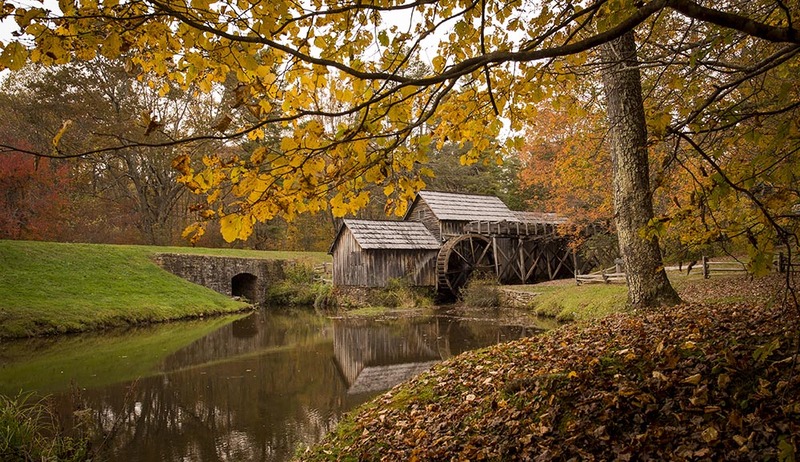 You’ve got to stop at scenic Mabry Mill, the most photographed location on the entire Blue Ridge Parkway. Here you will find a gristmill and in autumn apple butter and sorghum making, trails and more, a must stopover. Cap off your Virginia Blue Ridge Parkway bicycling experience with some old-time Appalachian music at the Blue Ridge Music Center. Nearby Activities: Before you start the Parkway cycle, stop at the Veritas Vineyards and Winery then overnight at the Iris Inn, ideally situated by the northern terminus of the Parkway. Near Tyro, overnight at the eclectic Blue Haven Farm 151 B&B, then visit nearby Mountain Cove Vineyards. The one and only Natural Bridge is off the Parkway near Glasgow. Consider a fall color float on the James River near Buchanan. Outfitters are waiting to rent you a canoe or kayak then shuttle you upriver. Take in the view from the Roanoke Star. Bicycle your way to Roanoke’s Museum of Transportation. Taste some Italian wine at Villa Appalaccia Winery near Rocky Knob. Overnight at Fancy Gap Cabins and Campground. The Route: This under-the-radar 240-mile route offers some lesser-heralded natural beauty in the Virginia Appalachians. It does have challenging segments, so plan your exact pedaling route with care. Know that the area is visited enough that accommodations for visitors are available. The route starts in the mountain town of Monterey. 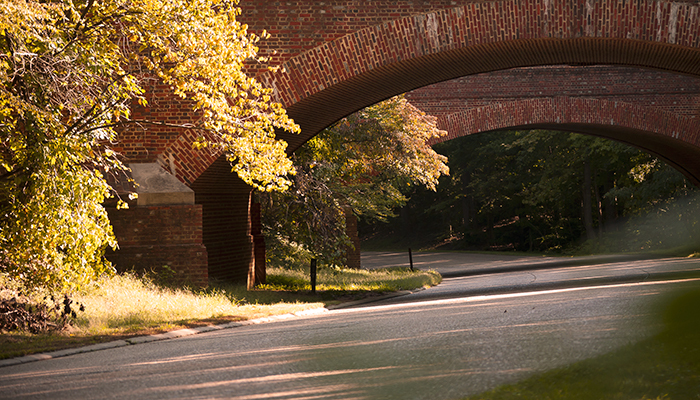 Here you join US 220, a two-lane track that is a Virginia State Scenic Byway. It travels southwest, the predominate axis of the ridges of the Appalachians, to reach Warm Springs, then the historic retreat of Hot Springs, serving visitors for two plus centuries. Ahead, enter Covington, the only city along the route. Join VA 18 and travel up bucolic Potts Creek valley, a scenic vale if there ever was one. Beyond Potts Creek is where it gets tough, as you surmount a few ridges on US 311 to reach New Castle. Next head west on VA 42, following Sinking Creek to Newport, then cross the famed New River at Eggleston on lesser paved roads. Rejoin VA 42 and continue among mountain splendor along winding Walker Creek, another rural valley frozen in time, to reach Bland. From there a series of stream valleys leads you still southwest to quiet Broadford. At that point pick up VA 91, winding amid farm and field to reach the ultimate outdoor and bicycle friendly town of Damascus. Join the converted rail line that is the Virginia Creeper Trail for the 17 final miles to end in Abingdon, home of the Barter, the Virginia State Theater. The Highlights: Much of the road cycling trip borders the Jefferson National Forest, singing its fall colors above while you pedal along woods and fields, almost always with a scenic stream meandering nearby. Leave Monterey in aptly named Highland County. Appreciate the designated state byway portion of the route from Monterey all the way to Covington. On the way reach Warm Springs and Hot Springs, where not only can you soak in soothing waters, but also spent the night and eat out in style. By all means pull over to visit incredible Falling Spring Falls. The road winds before dropping into Covington. Enjoy the quiet ride up Potts Creek Valley before the ups and downs on US 311, where you are rewarded with good vistas. From New Castle, ride the lowlands flanked by long wooded ridges then drop to the one and only New River Valley. From there you will be entering big Walker Creek and beyond, dipping in and out of several valleys. Turn south at Saltville, named for its salt works in the days of early Virginia. Roll into Damascus and there you pick up the Virginia Creeper Trail. Turn toward Abingdon then cross South Holston Lake on a memorable view-laden trestle. End your road cycle in downtown Abingdon. Nearby Activities: Drink some homemade hard cider in Monterey’s Big Fish Cider Company. Soak in the Jefferson Pools in Warm Springs, then take in some live music at Garth Newel Music Center. 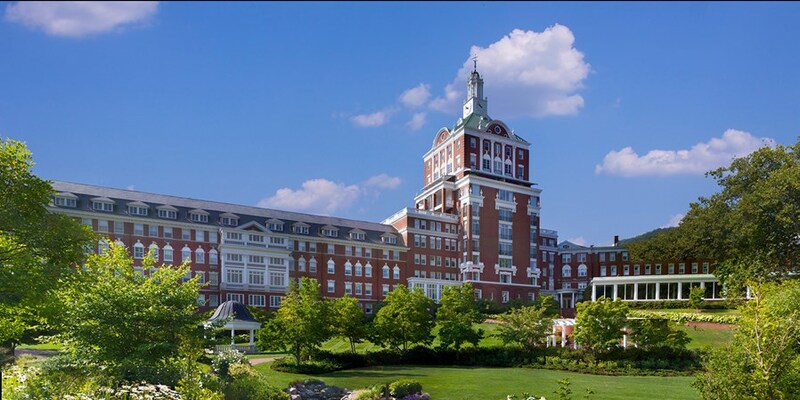 Lodge or dine at Hot Springs’ The Omni Homestead Resort, first established in 1766. Eat at the Cat & Owl Steakhouse near Covington. Devour breakfast, lunch or dinner at the Pine Top Restaurant in New Castle. Tackle some rapids on the mighty New River where outfitters supply boats and shuttles. Enjoy the views and the Wines at Giles Mountain Vineyard & Winery near Staffordsville. Take a side ride to the Falls of Dismal, and a few steps on the Appalachian Trail. Camp at quiet Walnut Flats. Hunt for antiques at Old Post Mercantile in Bland. Grab a view at legendary Big Walker Lookout Tower. It is mostly just you and the countryside until Damascus, then you are in the friendliest town on the Appalachian Trail. Here, hikers and bikers converge to ply the paths spearheaded by the Virginia Creeper Trail and the Appalachian Trail. Stop at iconic Mount Rogers Outfitters. Stay Damascus Old Mill Inn or one of the B&Bs in town. At road’s end take in a play at the Barter Theater in Abingdon and rest up at the famed Martha Washington Hotel in town.